My daughter, age 19, loves making these Gravity Cakes, for the book we just received. With the bright, colorful pictures, it takes barely any effort to make the perfect Gravity Cake every time. We work at them for an hour or so, and whala, perfection. 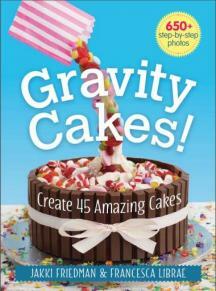 There are 45 Amazing Cakes to choose from in this book by Jakki Friedman & Francesca Librae. They’ve really made it an easy obsession, to make Gravity Cakes. I’d never even heard of a Gravity Cake, until receiving this book. They are so much fun to make, with my daughter. And, easier than I could’ve ever imagined. My favorite is “Beach Party”. My soon to be 6 year old loves the beach, so this is perfect for his birthday. Sarah, my daughter, and I have been working hard to get this one down pat, so that Jacob has the perfect Gravity Cake for his birthday. I’m all about freezing it, once it’s fit to perfection. We started it last night, and we said we would finish it today. The instructions couldn’t be clearer, and the colorful pictures help to illustrate exactly what to do. We got this! Full color throughout, these projects will spark your imagination and provide loads of decorating inspiration. There’s a cake for virtually every event and occasion — from Valentine’s Day to Thanksgiving and from baby reveals to poker parties, and everything in between. Once you’ve mastered the techniques, it will be no time before you’re using your imagination to create your own unique designs. My daughter told me after we make this cake, for Jacob, the book is becoming hers. So I better get this recipe right, but it won’t be hard with Jakki & Francesca’s step by step directions. You really need to get this book. It’s fabulous.